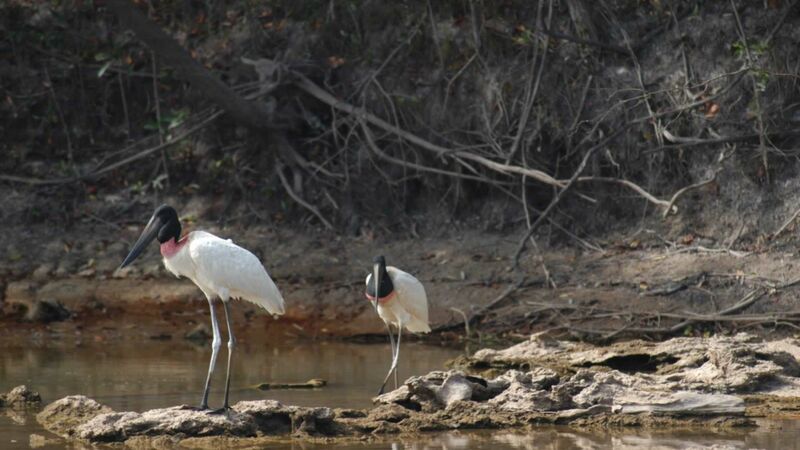 You will see remarkable birdlife and wildlife on these rivers. This past year, we watched flocks of macaws fly noisily across the river, toucan fly furtively across a lagoon, and, most impressively, a jaguar hunt and eat a capybara. If the fishing ever slows down, you will be able to experience the biological diversity that still exists in pristine portions of rain forest. We have an extensive trail system at the Agua Boa Amazon Lodge. The trails wind through savannah, gallery and flood Forest. They are well maintained and are well marked so that guests can wander without worry of getting lost. With normal water levels, the beaches on the Agua Boa are spectacular. White sand and clear water make for some of the best swimming in the Amazon. At any point in the day, your guide will be happy to hang a hammock on a nice beach to let you enjoy a swim. There is not a problem with either fish or animals. Swimming is as safe as any beach in the world. There are relatively few insects on the Agua Boa due to its acidic waters, but there are a few hours in the day when you will want to make sure you are extra cautious. In the evening and early morning, the no see ums will be a problem. You won’t feel them bite, but you may feel them itch. Some people are allergic to no see ums so please take caution your first few days. With repellent, long pants you will hardly notice them. If you take care during these hours of the day, you will not have problems. Need to talk to someone about the Amazon? Give us a call.